Bare bones simplicity. Tart common sense. That's the trademark style of Charlotte Joko Beck—offered here on Living Everyday Zen to help you realize the fruits of your sitting practice in every aspect of your daily life. 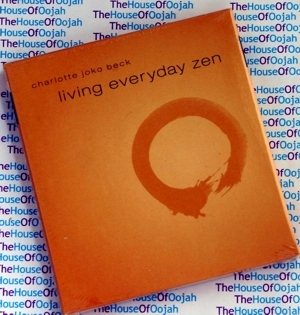 Charlotte Joko Beck is a Zen teacher in the United States and the author of the books Everyday Zen: Love and Work and Nothing Special: Living Zen. Born in New Jersey, she studied music at the Oberlin Conservatory of Music and worked for some time as a pianist and piano teacher. She married and raised a family of four children, then separated from her husband and worked as a teacher, secretary, and assistant in a university department. She began Zen practice in her 40s with Hakuyu Taizan Maezumi in Los Angeles, and later with Yasutani Roshi and Soen Roshi. Having received Dharma transmission from Taizan Maezumi Roshi, she opened the San Diego Zen Center in 1983, serving as its head teacher until July 2006. Joko was responsible for a number of important innovations in Zen teaching. In particular, she taught students to work with the emotions of everyday life rather than attempting to avoid or escape them. Because she was adept at teaching students to work with their psychological states, she attracted a number of students who were interested in the relationship between Zen and modern psychology. Several of her Dharma heirs are practicing psychologists/psychiatrists. In 1995 Joko founded the Ordinary Mind Zen School. She now lives in Prescott, Arizona, where she teaches part-time. The five-day sesshins she leads in Prescott several times a year still draw so many participants from around the country that would-be participants are required to fill out an application form as part of a selection process.